Hi everyone! 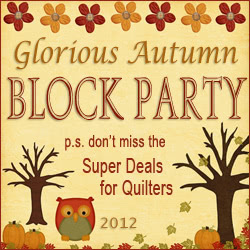 Welcome to Block 34 of our Glorious Autumn Block Party. We have four weeks left of our party. I really hope you’ve been enjoying this series. Today we have Megan Ziegler as our featured designer and the Fat Quarter Shop has a fabulous Super Deal. Be sure to check out Megan’s great give-away too! The Fat Quarter Shop was founded in 2003 by Kimberly Jolly. An avid quilter, Kimberly began her shop as a side business while still working a corporate position, cutting, packing and shipping right out of her house during evenings and weekends. From the very beginning, she was committed to delivering top-notch service for every single order and customer. As the Fat Quarter Shop’s reputation grew, Kimberly decided to make it a full-time operation. Her husband Kevin joined her not long after, and with his help, lots of hard work, and a tireless commitment, the store began to grow. Over the past few years a few more people have joined the staff! As a team, we continue to branch out with the best fabrics, exclusive kits, quilt clubs, BOMs, and more. And we will always be driven by the passion that Kimberly founded the store upon, which is always giving you the best products and service. 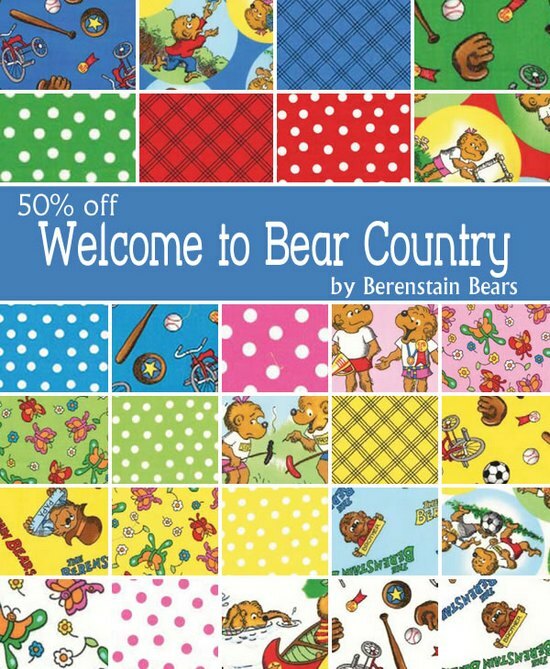 50% off Welcome to Bear Country by Berenstain Bears for Moda Fabrics! Shop precuts and yardage at half off! No coupon code required! Shop early for best selection, sale ends when the fabric is all gone. Growing up I was surrounded by quilting. It was my mom’s hobby and when we would go on family vacations we’d forever be stopping at quilt stores. I always loved looking at all the colors and textures of the fabrics, but it wasn’t until college when my own interest really blossomed. A quilting store opened only a mile from my school and I was hooked! I can remember vividly Christmas break several years ago, I was at home by myself and I picked up several issues of American Patchwork Quilter. I began reading about designers Sherri Falls and Heather Mulder Peterson. Then I got online and looked at their web sites and blogs. I couldn’t believe that there were people who actually got to quilt for a living, I couldn’t imagine anything better! That’s when my own dream began to form. This past summer I finally got the opportunity to take a break from work and school and decided to take a leap of faith by starting my own pattern company. Every morning I wake up and can’t wait for the day to start. I finally feel like I’m doing what I was always meant to do. I am so fortunate to have found my passion and am able to share it with others! Hmmm … this is hard. There are so many beautiful quilts. If I had to pick one, it would probably be (at least so far) “Vinny’s Valentine” that I designed. 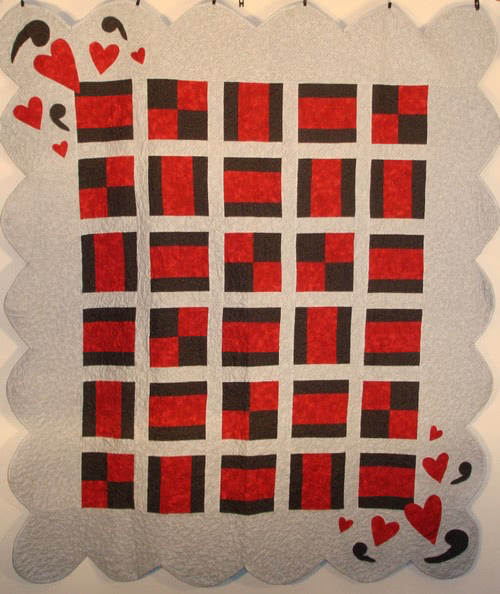 This quilt has special significance for me because I designed it in honor of my cat, Vinny. It also is the first quilt in our Lend-A-Paw™ designs program. You can read more about Vinny’s story and our Lend-A-Paw™ program on our web site. How many UFOs do you currently have? Too many to count! Eeks! 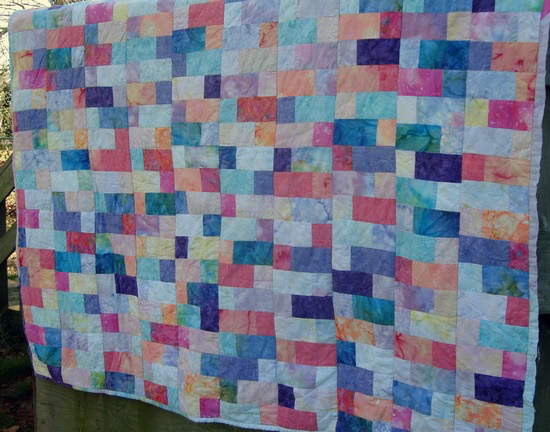 What size of quilt do you prefer to make/design? Lap quilts! They’re great to just have around the house ready for anyone who needs to snuggle down. What colour do you use most often in your quilts? I love the color red and try to use it as much as possible! Favourite one-sentence tip for a new quilter: Relax and enjoy, quilting is supposed to be fun! Favourite size and brand of rotary cutter: Can’t live without my Olfa 45mm Deluxe Ergonomic Rotary Cutter. Love this thing, I have carpal tunnel syndrome, so using a rotary cutter that has a nice grip is very important for me. It is also a great size (not too big, not too small) to work with a variety of cuts of fabric. Here’s Megan’s block: Autumn Bliss. She’s included an excellent photo tutorial with tips on putting together this block. Head over to Megan’s blog to view the tutorial and download the templates here! 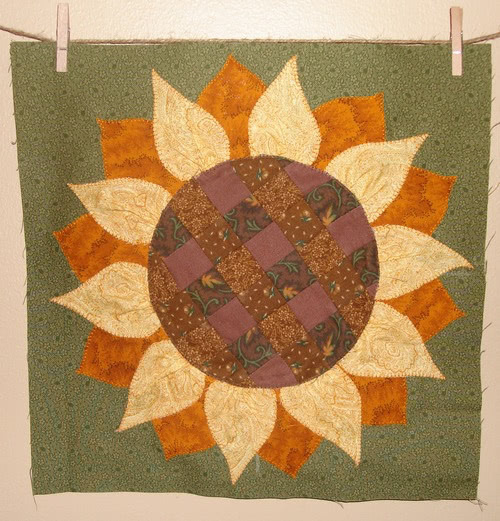 See the previous free quilting blocks! 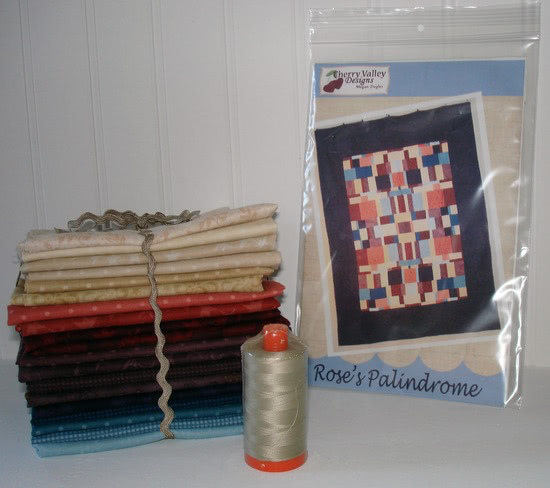 Megan’s give-away includes a fat quarter bundle of Buggy Barn prints, a spool of Aurifil thread, and a copy of one of her first patterns – Rose’s Palindrome. Give-away runs through Tuesday, November 27 when a winner will be chosen at random. Header over to the blog to enter the give-away.